Panel will propose steps to address "persistent crisis" in affordability. Gov. 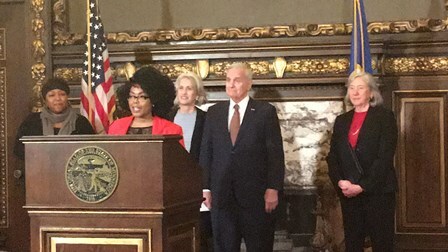 Mark Dayton announced Thursday the creation of a large task force to examine and make recommendations on affordable housing, calling it a “persistent crisis” for Minnesota families. The nonpartisan Governor’s Task Force on Housing will make recommendations by July 31 to include specific policy proposals and actions that can be taken by the executive and legislative branches of state government and the private sector “to improve housing stability in the state,” a news release said. It will be co-chaired by Jeanne Crain, chief executive of Bremer Financial Corp., and Acooa Ellis, director of social justice advocacy for Catholic Charities of St. Paul and Minneapolis. In his remarks at a news conference, Dayton said that wages of lower- and middle-income people have remained stagnant or declined in real dollars while rental housing costs have gone up. The task force will be made up of 15 members including public officials and representatives from business and nonprofits as well as a public advocacy group. The panel also includes 13 ex officio members.